Lester is a retired Police Officer, having served 30 years Metropolitan Police Service and for the last 14 years taught Self defence to other Police Officers as well as Emergency Life Support. Lester began training in Shotokan karate in 1981 at the Budokwai dojo in Gilston Road, Chelsea, London and was the student of Sensei Caesar Andrews - at one time Sensei Enoeda's right hand man. Lester's training had to stop because of work but re-commenced his training at the Ruislip/Hayes Karate club, run by Sensei Ged Smith, where Christopher, his son, started his training. This club has since changed it's name to Shin Do Kai. It was under his Sensei's instruction that Lester was awarded his Shodan by Enoeda Sensei 9th DAN. He has taken part in many local competitions and the Southern Regional competition. Lester's ambition has always been to run his own club, however, he did not envisage starting the club before he was a Shodan! Opportunity knocks. On Saturday 18th September 1999 Lester held the first TSKC class. As of 13th November 2008, Lester will be running 11 clubs under the TSKC banner in Buckinghamshire holding classes over 6 days. Lester co-instructed with Demi at the Medbourne dojo in Milton Keynes from January 2007 for about a year. Due to injury, Demi has had to retire from teaching. Lester underwent an Instructor Assessing programme in April 2001, where his teaching methods, technical and physical capabilities were examined by Sensei's Sherry, O'Connor and Strachan at Chesterfield's Queens Park Leisure Centre. Later that year, Lester attended a special Referees and Judges Course, where along with other Karateka took a 2 day intensive course followed by a written and practical examination. There were 10 candidates on the course, of which Lester was one of two Shodan students. The examiners and Instructors for that course were Sensei's Sherry, Naylor and Poynton. Lester passed admirably, becoming an Official KUGB Judge. Since then, Lester has Referee'd and Judged at the Southern Region Championships, 6th KUGB Children's Nationals, Inter Club Competitions and Essex Trophy competition and officiated at the National Championships 2002 and 2003 at the NIA, Birmingham. October 2003 was a significant time for Lester. A decision had to be reached with regard to the future of Tairyoku SKC. The last grading with the KUGB was undertaken and the move to JKAE was confirmed. Lester's qualifications with the KUGB will stand him in good stead when he re-qualifies under JKAE / EKGB. On Saturday, 13th March 2004, Lester was assessed by an EKGB qualified Assessor, Sensei Peter Welsh 5th DAN JKA, and qualified as an EKGB Instructor. On 2nd May 2004, together with 10 members of TSKC he attended the shotokan International Course held at Guildford and it was here that Lester took his first Nidan grading. The grading examiners consisted of Sensei's Tanaka, Ohta, Tomita and Wood. It's tougher than was expected, which was borne out when 5 minutes into being tested for his kihon, Lester muttered something to the effect of: "What the hell am I doing here!" More out of frustration than anything else. Lester came away, having passed Kihon and Kumite, Kata only next time. His next attempt was successful and passed. 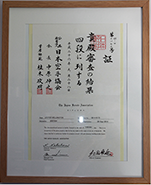 On the 4th December 2004 - exactly 5 years to the date of passing Shodan - Lester successfully graded to Nidan. The examining instructors were Sensei's Aoki 7th DAN Chief Instructor JKA Spain and Ohta 6th DAN JKA England. Sensei Ismail was present too. On Sunday 24th August 2008 whilst attending the International Course at Guildford, under the eyes of Senseis Ueki, 8th DAN and Surasako, 7th DAN and Ohta, 6th DAN Lester successfully graded to Sandan. Lester has now passed his fourth DAN grading, Yondan, in front of Sensei's Shiina, Sawada and Ohta all 7th DAN JKA instructors. Since the club was opened in September 1999, Lester has trained over 29 students through to Shodan or above; taken one student from novice through to a very good instructor within the club; been instrumental in training two of the students to such a level that they were picked to represent England in JKAE and currently still hold that prestigious position to this day. Together, they have represented England in both World and European Championships. The club has also been very successful in Open competitions it has entered. There are 10 dojo locations available for students to train at, throughout Buckinghamshire and Bicester. Bryan started karate with his daughter, Sophie, in March 2000. He was soon hooked, attending every lesson and successfully grading every three months. Having not done any sport after leaving school it was hard to get into shape, but after six months he began to build up stamina. Bryan has attended several competitions with varying results. The first competition he was not well prepared and he came home with a black eye. With perseverance he obtained better results. Bryan soon decided, at 3rd kyu, that he wanted to teach, and with supervision began to take lessons, working hard on his techniques and plans. On 20th August 2004 Bryan attended the Shotokan International Course held at Guildford. The three day course incorporated DAN grading, and on the 22nd August 2004 Bryan passed his Shodan grading. On Saturday, 27th November 2004, Bryan was assessed by an EKGB qualified Assessor, Sensei Peter Welsh 5th DAN JKA, and qualified as an EKGB Instructor. Bryan runs the class at the Winslow dojo on a Friday to complement the Tuesday class run by Sensei Lester. On Sunday 11th July 2007 at the Sports Hall, University of Bath, Bryan, together with his daughter, Sophie, successfully graded to Nidan under the very watchful eye of OHTA Sensei. Graham joined the club in January 2004, just after Christmas. Some 7 months later his son joined and then in October, so did his wife, Jill. Graham has been one of the most dedicated students this club has ever seen, training on average 3 times a week but usually 4 times a week. Having been involved in a serious motor cycle accident some years ago, Graham suffered some horrendous injuries. As a result there are bits of metal all over Graham which causes problems when twisting is involved but this never stopped Graham from persevering and in December 2007, Graham attained his Shodan at the DAN Grading in Walton on Thames. Outside of training, Graham enters all the competitions he can, attends ALL the training classes held locally or by the JKAE and attends every social function too. He is also very instrumental in producing the TSKC branded clothing and Sports Bags. On Tuesday 6th January 2009 Graham opened his own dojo in Waddesdon Village Hall and we wish him the best of luck for the future. Wishing to progress, Graham took his first Instructors Licence and Referees Grade 3 in February 2010 which he passed. For a number of months, following the closure of Ardley SKC by Sensei Smith, Graham was an Assistant Instructor at Bicester SKC, attending every Monday evening to provide JKA instruction for the club. In May 2011, the Chief Instructor of he club, decided that JKA was no for him and asked Graham to take over the running of the club. Graham wanted Bicester to become part of TSKC and is now running it as such. Regular classes on Thursday evenings. Jason joined TSKC at the age of 5½ and has been an integral part of the club ever since. Jason favours training at Bierton and Fairford Leys. Jason took over the running of Fairford Leys dojo in April 2013. At the age of 10, Jason was recommended to attend the JKA England Squad trials where he was accepted and has been a part of the squad to this day. Now a Nidan and attaining the age of 18yrs old, Jason has moved up from the Junior Squad to the Senior squad and represents England as a Senior and as a Cadet. He has had numerous and various successes in competition, the most notable at the European Championships at The Stade de Pierre Courbertin in Paris, the setting for 9th International Cadet and Veterans Championships hosted by JKA France where Jason was the Silver medal winner. Jason passed his Coaching qualification in May 2013. Aaron had previously trained in karate at another Association a few years before coming to TSKC to enrol his daughter, Rachel. Having sat and watched a few lessons, the urge came back for him to start training again. In September, 2015, two years from the day he joined TSKC, Aaron took his Shodan grading and passed. After training alongside his daughter, Aaron showed interest in wanting to teach. Teaming up with Jason, he jointly runs the Fairford Leys dojo. Aaron also trains alongside his young son, Gilad. Keith spent a lot of his time working in South Africa before coming back to England to work and therefore spent his time training in a South African dojo. Originally, Keith is from the North of England - not that you wouldn't guess from his accent. He is a dedicated karateka training twice weekly, every week. He is always available to help out the club when an Instructor is unable to take a class; keep the club open whilst other Instructors and students attend Courses or competitions. Keith is a true stalwart in the club. He is a great supporter of the club's social events too. Dave joined us in January 2011 and from the 'Get - Go' showed immense enthusiasm and great potential for the Art. For around 2 years, he trained alongside his son Aidan and having gained the coveted Black belt, continued to train as hard as ever without losing any of the enthusiasm he had from the start. Dave is always willing to step in at the last moment to cover a class in Winslow, Buckingham or Medbourne when an Instructor is unable to take it. Dave has a great approach in the way he teaches bringing a different way of training in the dojo. Tony was practising karate at Ardley Karate Club run by Leon Brown. Complementary training also took place at a nearby club in Bicester which eventually joined JKA England. Due to unforeseen difficulties, neither Leon or Dave Smith could not continue to run either Ardley or Bicester respectively. TSKC took over the running of the clubs and merged them into what is now the Bicester Club run by Graham. Tony continued his training throughout and having reached 1st KYU assisted Graham at the Bicester dojo where his daughter, Anne, trains. Tony also trains at the Waddesdon dojo. On 28th February 2016 Tony took his Shodan grading in front of the Chief Instructor of jKA England and passed first time. Congratulations. Again, Tony is a great supporter of the TSKC social events.